Where is the 169th Engineer Combat Battalion? This is a collection of information coming from different sources, my task was to reorganize them in a readable shape and make it available. The idea started in 2009 from a friend who decided, in restoring a 1942 Willys, to dedicate it to the 169th Engineer Combat Battalion. At the beginning very few information were available, we know the 169th was activated in September 1944 in Florence and the “Fleur de lys” was on the shield. Only few lines are dedicated to the 169th Engineer Combat Battalion on the book “CORPS OF ENGINEERS: THE WAR AGAINST GERMANY” and no details about their activities. Surfing on the net I found the website dedicated to the VI Corps Engineer Combat Regiments. Marion J. Chard and the guys of the VI Corps Forum put me on the right track with help and hints in searching the information of the 169th Engineer Combat Battalion. A new contribution come in 2018 from Roger L. Knight, a 1LT with the 169th Engineer Battalion (Construction) in Vietnam. Roger was working on the history of the 169th and found our website; we provide our part of information and Roger provide us the information coming from his research at the National Archives II, College Park, Maryland. The map showing the HQ and the main bridges is one of the results of that contribution. One more contribution come from Sean Michael Griffing, grandson of John Francis Griffing member of the 337th Engineer General Service Regiment and then of the 169th Engineer Combat Battalion. Sean share with us the documents and the pictures of his grandfather John Francis Griffing. The men of the 169th Battalion were part of the 1st Battalion of 337th Engineer General Service Regiment. The 337th Engineer General Service Regiment was activated at Camp Swift, Texas, on 20th July 1942. It embarked from New York Port of Embarkation on 29th April 1943 landing at Oran, Algeria, twelve days later. The 2nd Battalion of the 337th Engineer General Service Regiment landed on Red Beach, near Paestum at 1630 hours on D Day, the 9th September 1943. 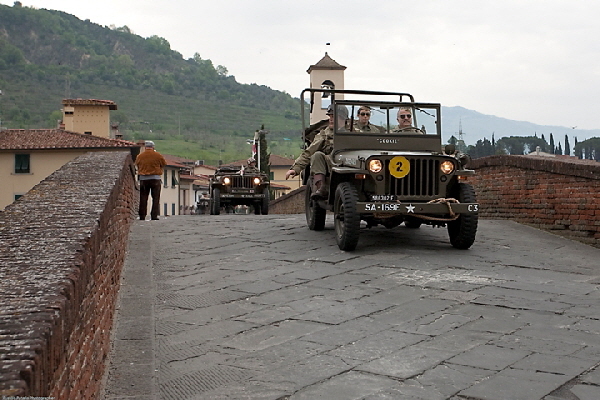 The picture shows the freshly restored Willys of 169th Engineer Combat Battalion crossing the Medici’s Bridge in Pontassieve near Florence in 2009. On the shield of the 169th we find the “Fleur de lys”, the arm of Florence, in honor of the city where the battalion was activated with the personnel of the 1st Battalion of 337th Engineer General Service Regiment. Scarlet and white are the colors of the Corps of Engineers. The fleur-de-lis flowered was suggested by the coat of arms of Florence, Italy, where the battalion was activated after being reconstituted in 1944. The dovetail is used to allude to an engineering construction principle. The three points represent the organization’s three battle honors awarded for service in Italy during World War II. The motto is “ Mind and Hand ”. The 337th Engineer General Service Regiment was activated at Camp Swift, Texas, on 20 July 1942. The Regiment was moved during the latter part of January 1943 to the Louisiana maneuver area near Camp Polk, and participated in Third Army maneuvers during February, March and the early part of April 1943. Upon being relieved of duties in the maneuver area, the Regiment was alerted for overseas movement staged at Camp Miles Standish, Massachusetts, and embarked from New York Port of Embarkation on 29 April 1943 landing at Oran, Algeria, twelve days later. The regiment was assigned to Fifth Army in June 1943 and operated in the vicinity of Oran and Algiers, with Company “F” attached to Fifth Headquarter at Oujda, Morocco, and later at Mostaganem, Algeria, Company “B” was attached to the 344th Engineer General Service Regiment for invasion training from 20 July to 29 August 1943. On 13 August, the 2nd Battalion was attached to VI Corp and began invasion training near Valmy, Algeria. On 16 September 1944, the 337th Regiment was disbanded, and the personnel of the regiment were transferred to the 1338th Engineer Combat Group, which was activated the same day. The personnel of the 1st and 2nd Battalion made up the newly activated 169th and 182nd Engineer Combat Battalions. The 185th Engineer Combat Battalion was originally Battery “A”, 213th Coast Artillery Regiment Anti-Aircraft, upon induction into Federal service on 16 September 1940. The next month was spent in training until the U.S. entered the war in December 1941. At that time, the unit departed from Fort Eustice in two hours and rushed north to protect the New York harbor. The battery was expanded into the 3rd Battalion, 213th Regiment, on 13 June 1942, after additional cadres were added. On 1 November 1942, the unit left New York harbor aboard the U.S. Army transport “John Ericson” for Casablanca. The regiment operated in North Africa until 1 April 1944, when the unit was reorganized in a separate Battalion, the 337th Anti-Aircraft Artillery Searchlight Battalion which continued the air defense of Naples until after the fall of Rome. The unit moved to Civitavecchia on 26 June 1944 and maintained Anti-Aircraft position around that port until inactivation on 24 September 1944. The entire personnel were transferred to the 185th Engineer Combat Battalion, which was activated on 25 September. Four days later, the battalion moved near to Sernallino, was attached to the 1338th Group and began a six weeks course in engineering training. The 2nd Battalion of the 337th Engineer General Service Regiment landed on Red Beach, near Paestum at 1630 hours on D Day. The Battalion was employed primarily to assist in the unloading of supplies on the beaches and the setting up of dumps, as well as the maintenance of roads, clearance of mine fields, and the expedition of troop and supply movements. It was not possible to do much the first few days, because the delay in landing the battalion’s equipment. When it finally was unloaded, the individual companies of the battalion were assigned work in the forward areas where occasional small arms fire by snipers was encountered, but no casualties were suffered. On the third day, the 2nd Battalion was alerted for combat duty; information had been received that the enemy was preparing a counterattack to eliminate the beachhead. Accordingly, the units of the battalion took up defense positions. On 14 September 1943, Company “D” moved to an area about one and one half mile east of Paestum, near the foot of the Monte Soprano Range, and “dug in”. The following day, during an air raid , an enemy plane was forced to escape over the range, and on its way, dropped a 500 pound bomb in the bivouac area, resulting in the death of four enlisted men and the wounding of seventeen others. Active combat, however, did not become necessary and the menace of the approaching Eight Army caused the enemy to pass to the defensive. The battalion resumed its engineering work. The 1st Battalion and Regimental Headquarters left Mers El Kebir, Algeria, on 15 September and arrived in Italy on 21 September, promptly joining the 2nd Battalion. The regimental commander was Colonel W. L. Wedding. During the drive from the beachhead to the Volturno River, the 337th maintained Route #18 from Paestum through Salerno to Avellino, Route #7 from Benevento to Naples and numerous laterals involving approximately 180 miles of road. The maintenance of this road required the operation of three separate quarries, and the repair of an Italian rock crusher and its accessory hydro-electric power plant. In all, approximately 3000 cubic yards of rock were produced and used on the road system. On these routes, the unit constructed fourteen fixed bridges with a total length of 956 feet (average length: 68 feet). Of these, the Sele River Bridge was a major construction job and the first fixed bridge constructed in Italy by United State Army units. It was of trestle bent construction, sixteen spans, 240 feet long, and was constructed between 22 and 28 September 1943. The greatest problem was the lack of heavy equipment and bridge building material. The unit was also called upon to mark an extensive minefield, and clear mines for exit roads on the beach north of Agropoli. The Albanella Railroad Station was checked for mines and booby traps. The 337th performed demolition work for the 16th Evaquation Hospital near Paestum, removed Hanging wires from approximatively sixty miles of electrified railroad between Battipaglia and Naples, repaired tracks in the Battipaglia railroad yards, removed debris and demolished walls in Battipaglia, Eboli and Avellino, and constructed and painted 541 road signs. During the phase of the Italian campaign from 6 October 1943 to 11 May 1944, the 337th Engineer General Service Regiment’s major assignment was the maintenance of roads to expedite the movement of personnel and supplies to the forward areas. The regiment, under command of Colonel D.L. Hooper, was faced with the problem of keeping all roads open in such condition that every type of vehicle could safely use them. In normal weather, this requirement could have been met without undue difficulties, but with the rains during the month of November, December, January and February, the large quantities of mud deposited on all roads by vehicles leaving bivouac areas, traffic movement was seriously threatened. To solve this problem, the 337th constantly patrolled the roads with motorized road graders, while troops shoveled the mud off the road shoulders. A large number of civilians was employed in this phase of road maintenance in addition to the soldiers of the 210th Engineer Company. During the winter, the unit’s 420-mile road net included main and secondary roads from Avellino and Benevento to Isernia, Teano and Campobasso. The maintenance of these roads required approximately 30000 cubic yards of crushed rock – 9500 cubic yards of which was produced in April. Stock piles of 5 cubic yards of the rock and one barrel of bitumen were established every third of a kilometer on Route #7 between Capua and the Garigliano River. All other problems of road maintenance caused by the heavy rains were handled in a normal manner: among these were “weep holes” to ensure drainage of road surfaces, cleaning canals, ditches and culverts of obstructions and, whenever possible, the removal of debris from demolished bridge sites. Two overpasses were constructed to eliminate left turns and traffic congestion. One was constructed at the intersection of Route #6 and #7, the other at the intersection of Route #7 and Route #721. Double-single Bailey bridges were used to bridge the main routes of communication. 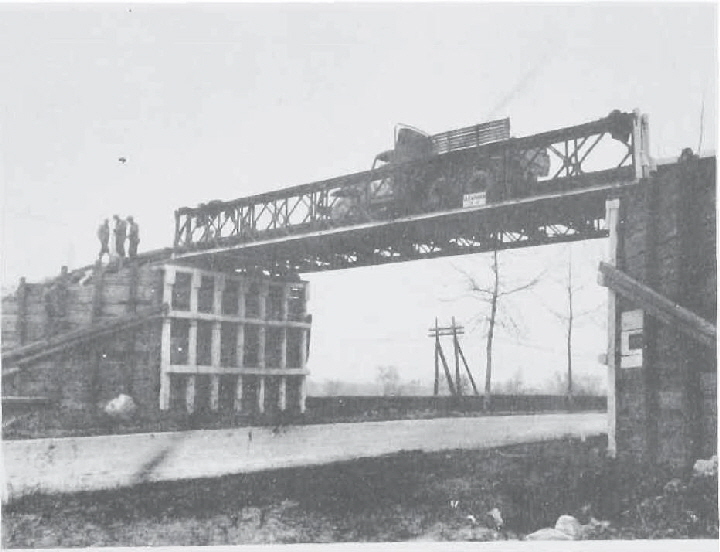 Both overpasses were just north of Capua; 19176 man-hours were required to complete the assigned jobs. 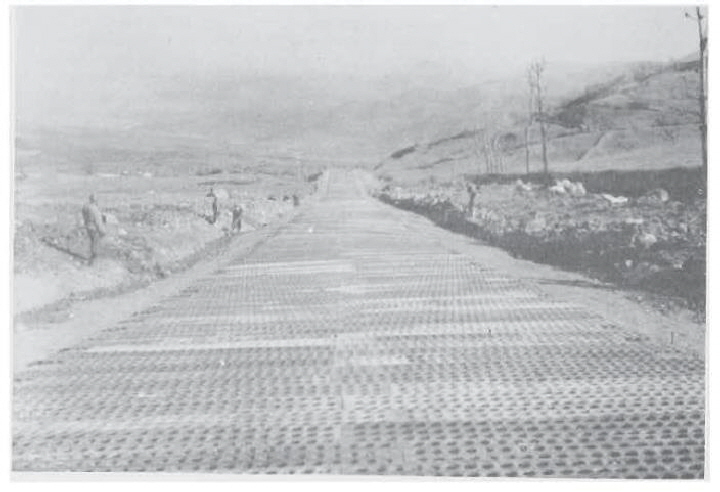 Approximately 415000 man-hours (inclusive of Italian Engineer and civilian labor) were required to maintain all assigned roads during the static phase of this campaign. To insure rapid movement of all traffic and eliminate bottlenecks, 12 12 semi-permanent wood and steel bridges were designed and constructed totaling 457 feet. As all of these bridges were of minor proportions, no unusual problems were encountered; standard design and construction was followed in each assignment. Two major and eleven minor Bailey bridges were constructed during this phase, with an aggregated length of 1610 feet. 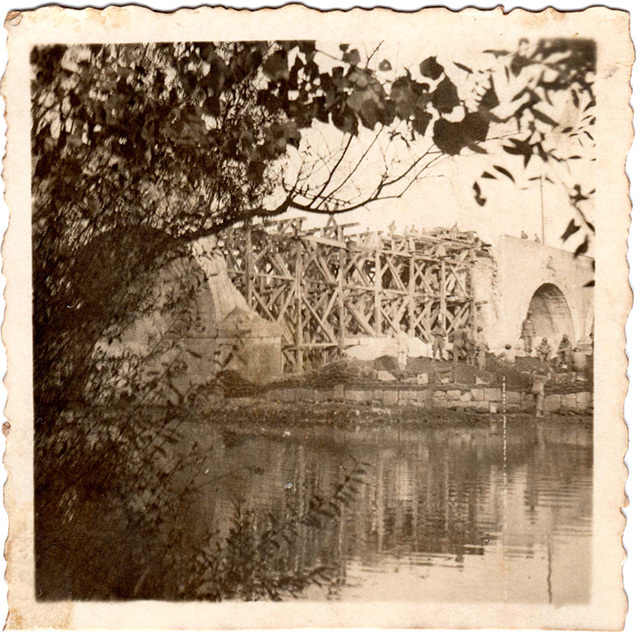 Grottaminarda Bridge in a picture taken by John Francis Griffing – Used with the permissions of Sean Michael Griffing. At Cancello-Arnone, the first triple-single, triple-double Bailey type bridge was built across the Volturno. The bridge was a 270-foot Class 40 with dual carriage-way. Two outer trusses were of triple-single construction, and a center truss, dividing the two lanes, was a triple-double support. It was constructed between the 12 and the 20 February 1944. During the winter campaign, the 337th developed a specialized mine removal and instruction team which cleared or checked twenty-one areas for mines and booby traps, in addition to the regularly assigned minefields and routine checking of all jobs. The team instructed ten units of all branches how to neutralize and remove enemy land mines and booby traps. Thirteen medical units were assisted during October – May phase of campaign. An Italian hospital was remodeled; buildings and tents area were checked for mines and booby traps; entrance and access roads were built; tents and pre-fabricated buildings were erected; water and sewage systems installed. During this same period, the 337th worked on forty-eight other assigned jobs for various units, requiring approximately 114000 man-hours of labor. Included in these assignments were the construction and painting of 10000 unit designation sign and holders, plus route and direction sign for all roads. A river gauging station on the Volturno River near Caiazzo was provided to protect the floating bridges downstream. The 337th also was engaged in a malaria control campaign. All stream, canals, ditches, culverts and fields were checked to insure that water was not allowed to stand in the vicinity of Francolise. 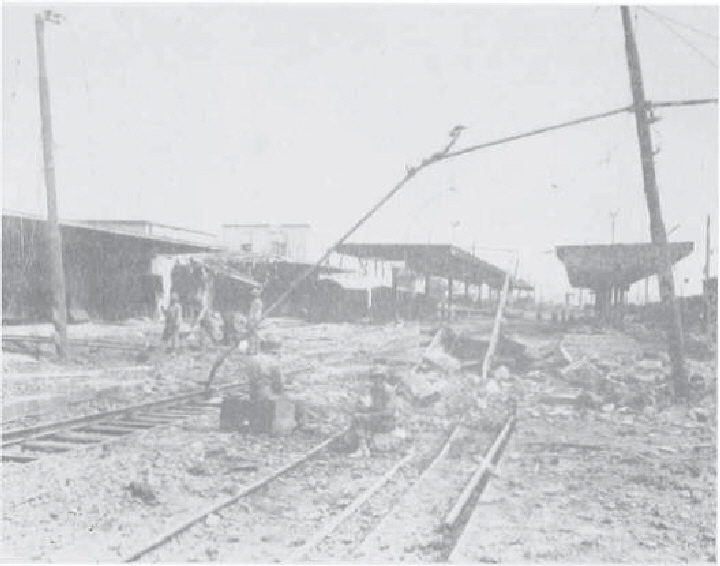 In accomplishing this task, several canals had to be cleared to provide adequate drainage, culverts had to be lowered and all shell and bomb craters filled. The regiment continued this sort of work until the beginning of the next phase of the Italian campaign on 11 May. During the period from the attak on Rome until the Arno was crossed, the 337th Engineer under Colonel D. Lee Hooper maintained approximately 1000 miles of primary and secondary roads. A large percentage of this mileage consisted of main communication routes included Route #7 from the Garigliano River to Velletri with lateral roads; Route #1 from Rome to junction of that highway with Route #68; Route #68 from Cecina to its junction with Route #2 near Poggibonsi; Route #2 to Florence. Approximately 6000 cubic yards of rock was produced to maintain these roads, most of which was used on bridge approaches and bypasses. Where dust was a hazard on main route, the roads where watered and in some cases oiled. In order to eliminate left turns and traffic congestion at intersection of Route #1 and Route #159 (near Piombino), a modified cloverleaf was constructed utilizing native roads wherever possible. Two overpasses were constructed, using log cribbing for abutment, dirt backfill, and 50-foot, double-single Bailey bridges to span Route #1. Eight thousand eight hundred man-hours were required to complete the assigned work. A single overpass was constructed at the intersection of Route #1 and Route #156 near Follonica to eliminate left turns for traffic coming from the north on Highway #1. Thirty-five semi-permanent wood and steel stringer bridges with aggregate length of 2150 feet, and 23 Bailey bridges with aggregate length of 2760 feet, were constructed during the same phase. 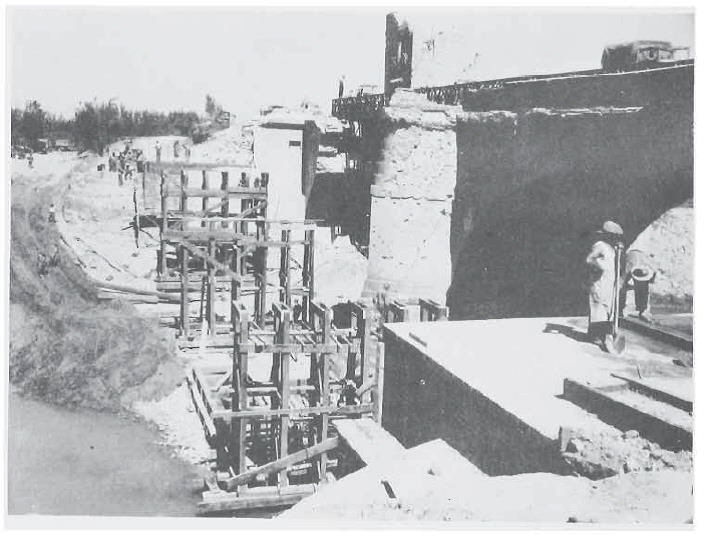 All bridges were of standard design and construction, utilizing native material whenever possible. 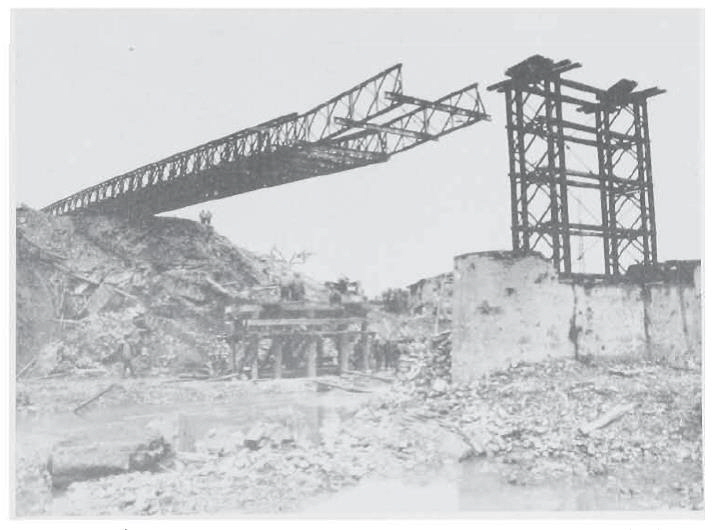 Stringers consisted of I-beams, channel iron, special 32-foot built-up girders, and in one instance, 67-inch built-up girders taken from Bagnoli Steel Mills near Naples. Pile bent and trestle bent span supports in general accordance with army bridge design were used. 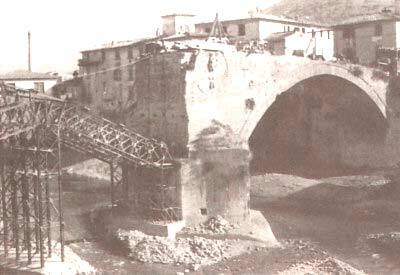 The 337th had the mission of replacing the destroyed bridge on Highway #7 across the Garigliano River. 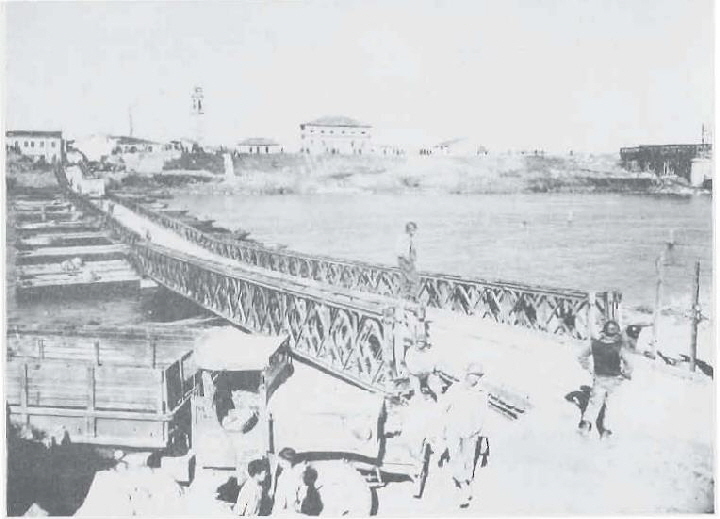 Reconnaissance and plans for the bridge’s erection had begun in January, and dump for the materials had been established in the vicinity of Sessa. Assembly and pre-fabrication of the materials had been started long before work began in May. The bridge was a four-span, 228-foot, two-way, Class 40 type built at the original bridge site. Two piles piers were required with a third timber pier constructed on an existing pier base, to support the steel stringers. The work which began on 17 May was finished in 148 hours, on 23 May. The bridge constructed on Route #7, from 29 May to 3 June, at Itri, was also two-way, Class 40 bridge. It was three–span, 92-foot , trestle pier bridge, with built-up steel stringers, prefabricated at Bagnoli. The road level was sixty-two feet above the ground line, making it necessary to brace the pier into the abutments. 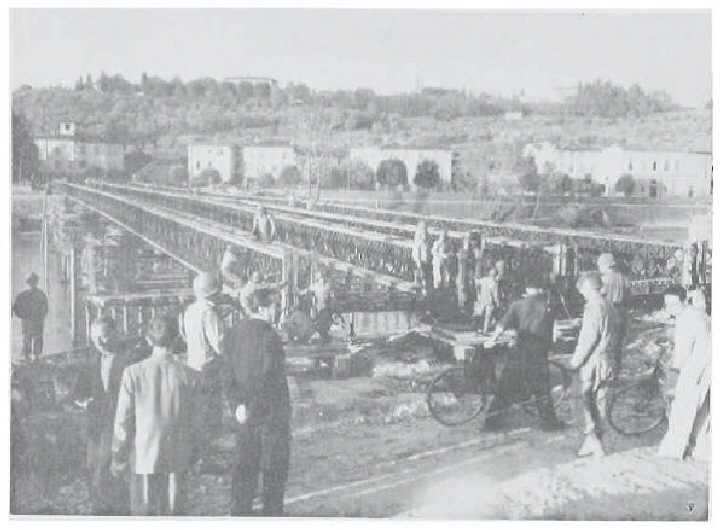 To facilitate the movement of supplies west around Rome, the 337th Regiment also built a crossing on the Tiber, just a short way east of the Army ponton bridge. The crossing consisted of one, one-way, Class 40, triple-single Bailey bridge, each 270 feet long. The site used was an unfinished concrete arch bridge, part of the road net for the Italian World’s Fair. Mine clearing and checking for minefields and booby traps were a major project throughout this advance. The trained mine crews were constantly in demand. Extreme care and discipline was required to keep accident and casualties down to a low percentage. D-7 tractors and power driven rollers were used to clear fields of wooden box-mines – they simply rolled over the mines and set them off. The mine teams worked on sixty-four assignment in all. One of these jobs was to clear a right-of-way for the 785th Engineer Pipe Line Company (a Peninsular Base Section unit), from south of the Garigliano River to Terracina. The streets of Gaeta was cleared of debris, mines and booby traps. A type of enemy mine not found before by the 337th was the “R” mine. While transporting a load of these to the Engineer dump, 30 of them exploded, killing the driver and the assistance driver. The regiment’s mine instruction team gave demonstrations, lectures and instruction in clearing and marking minefields to seven units during the summer months. Twenty-three medical installation were worked upon and other assigments included the construction of entrance and access roads and bridges, mine clearance, road oiling, construction of tent frames, preparing of landing strips, blasting sump holes and construction of black-out frames. During this phase, the regiment performed eighty-six other projects for different unit in the theater, which took approximately 52000 man-hours. 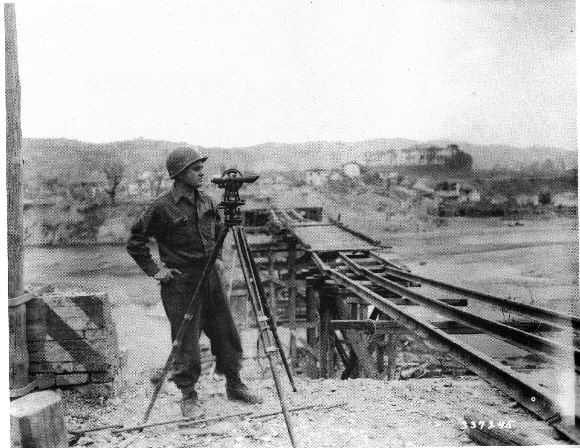 These assignments included dismantling “Damiano Bridge” across the Garigliano River, oiling roads, repairing levees, maintaining air beacons, removing treadway bridges, making traffic counts, setting up Fifth Army Command Posts, opening ditches and canals for malaria control, clearing sites and constricting roads for Quartermaster dumps and Ammunition Supply Points. 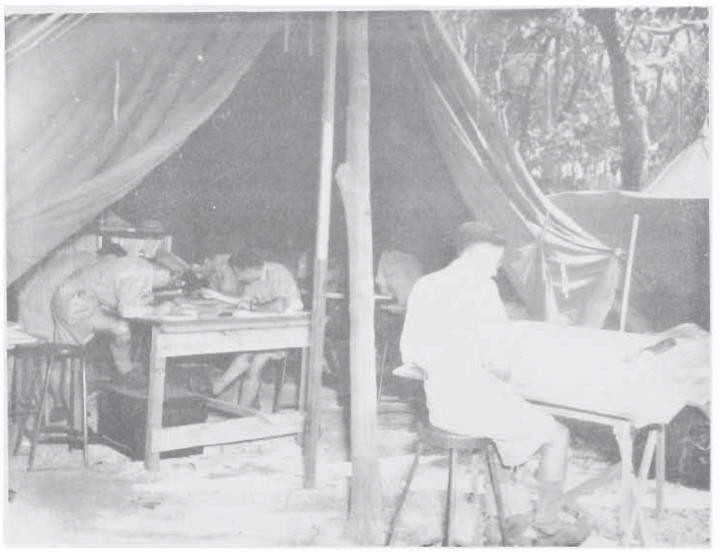 A Timber Bridging School for the British was conducted by the 337th. Two classes were held, one from 1 August to 16 August, the second from 28 August to 7 September, during which time, thirty officers and sergeants of the British Army were taught the Army methods of fixed bridges construction. Each course was divided into four phases. The first phase was a field trip and inspection of bridges, paying close attention to heavy traffic and high water. The second phase pertained to theory and design of the type of semi-permanent wood and steel bridges being built in the theater. The third phase was devoted to the actual design of bridges that the 337th was to construct. The student were required to make their own design of these bridges, using American methods. The fourth phase was the study of the construction methods in the field by observing bridges currently under construction by the regiment. One of these school was in progress, and some of the other elements of the 337th Engineer General Service Regiment were occupied with the construction of the Florence bridge as the summer phase of the Italian campaign drew to close. 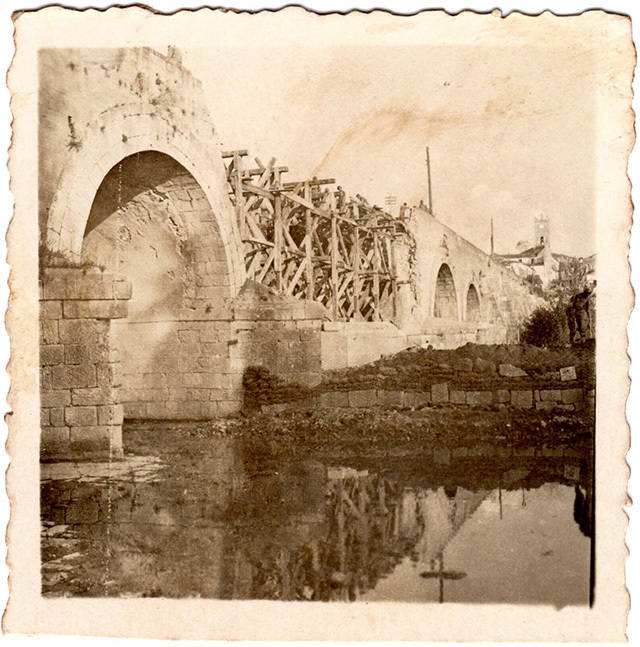 On 1 September, two one-way Class 40, 400-foot, triple-single Bailey bridges were begun across the Arno River at Florence by the 337th Engineer General Service Regiment, commanded by Colonel D. Lee Hooper. Three pile piers were driven simultaneously by using shovels on pontoon rafts. Four days later the bridges were completed. Another bridge was built across the Arno at Signa. It was a 430-foot, triple-single Bailey, five spans, with four pile piers. In addition to these bridges and ever-present smaller jobs, the 337th was working on an ever-increasing road net. After 15 September, when the 337th Engineer General Service Regiment was disbanded, and the 16 September, when the 1338th Engineer Combat Group was activated, the old 1st and 2nd Battalions became the 169th and 182nd Engineer Combat Battalions, respectively. During the winter, the group headquarter organized and supervised the work of one main snow station and five sub-posts on route #6529 and #65. It also organized a mine instruction team under the command of 1st Lieutenant John W. Schreiner, Jr, which marked and recorded seventy enemy and friendly mine fields, checked and cleared eleven areas and buildings for mines and booby traps, and conducted nine schools in mine warfare with a total attendance of 10212 officers and enlisted men during the winter phase. In the main, the 169th Engineer Combat Battalion under the command of Lieutenant Colonel Roy A. Doman continued without a break the work it had been doing as the 1st Battalion of the 337th Engineers. From 16 September until the end of October, the unit expended 116328 man-hours of labor. It opened and maintained ninety-four miles of roads, fourteen of which were nothing but mud when taken over. 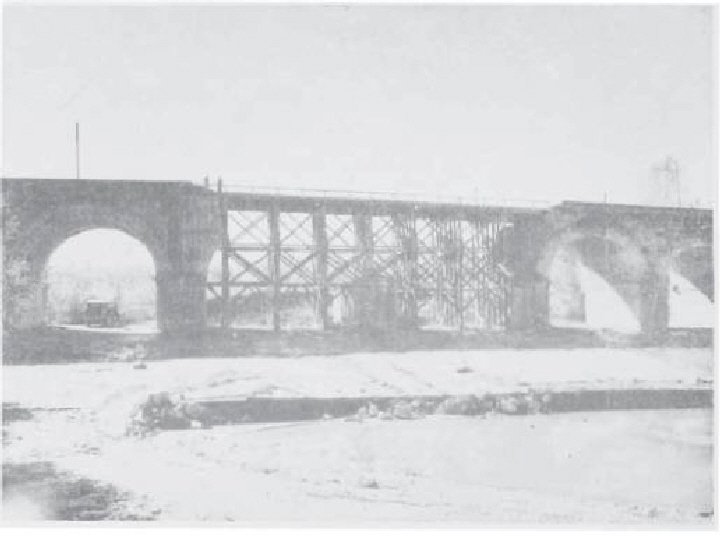 Nine thousand and one hundred seventy-six cubic yards of crushed rock and gravel were used; ten rock quarries were established and maintained; six semi-permanent timber bridges with an aggregated length of 254 feet and three Bailey bridges totaling 560 feet were built. A 24-hour-per-day traffic count was taken on Route #6529. At the end of a 10-days period, a total of 14122 vehicles had passed the station. A temporary prisoner of war enclosure was constructed south of the Arno, which included the building of doors, windows, latrines and the laying of a concertina barbed wire fence. Four water point were established which produced about 55000 gallons for many units beside the 169th during the months of September and October. The command post of the battalion made five moves, the fifth one on 22 October to a site on Route #6529, about three miles east of Highway #65. By now, all units of the battalion were located on Route #6529. The road at first was nothing more than a crooked, muddy, rock-strewn mule trail that had been in existence for a great many years. The battalion widened the road, improved drainage and curves, did revetment work and used all its personnel on resurfacing. On 23 November, two snow removal stations were organized along the road. During December, the 169th also maintained Route #937 to Castel del Rio from the junction of Route#6529, for the 182nd which was at rest camp. The companies of 169th went one at a time for five-days rest periods at Montecatini during the period from 16 December to 30 December. During the month of January 1945, a training program was put into effect which reviewed bridge construction and taught new types of mines. Two culvert were constructed from 26 January to 15 February to replace existing Bailey bridges. On 31 January, construction began on the semi-permanent “Charlie Bridge” on Route #937 north of Sassoleone. A triple decked Bailey bridge had been put in at this point, which required a great deal of jacking in order to keep in operational condition. An existing bypass was used during the construction period. March was spent mostly in the maintenance of roads and the cleaning up of all assignments. A sprinkling system was used daily on the roads. Several men in the battalion attended the Floating Bailey Bridge School at Capua. 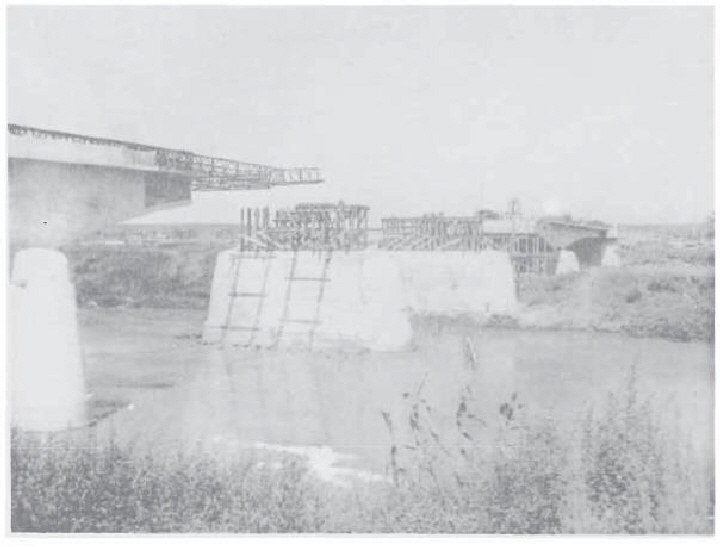 On 3 April, the 169th Combat Battalion moved to Cascina Nuova and began training for the building of a floating Bailey bridge across the Po River. The 182nd Engineer Combat Battalion had been the 2nd Battalion of the 337th Regiment before the reorganization. On 16 September, the unit merely continued its previous work. The battalion was under the command of Lieutenant Colonel Milton P. Barschdorf. The 182nd worked on the important supply routes from Florence north into the mountains. On Highway #65, asphalt patching was done, and improvement of bomb craters and demolition fills. From early September, progressive assignments kept the battalion occupied up to Raticosa Pass, where it was relieved on 22 October. Route #6524 started with its junction with #65 near S. Piero, and continued through Giogo Pass to Firenzuola. It was a one and one-half lane with huge demolition craters, and the 182nd made it into a two-way road, after working from 1 October to 25 October. The circuit was completed as Route #6528 was taken over and made two-way from Firenzuola west to Highway #65. The work on these roads entailed the erection of seven bridges, four of them fixed bridges. On Route #6528 near Castel del Rio, a 220-foot, triple-single Bailey bridge was washed out. The 182nd immediately drew up plans, and work was undertaken to replace the structure. In spite of high water, a Bailey bridge of similar type was built, utilizing one center pier of trestle bent design embedded in concrete foundation. The span was fifteen feet above the water level. Work was done on the areas of seven medical units, the Fifth Army Command Post, two engineer dumps, and three ordnance and three quartermaster units. Also four water supply points were improved for the 405th Engineers, an air beacon maintained, and a prisoner of war cage constructed in Raticosa Pass. On 27 October, work was begun on Route #937, a route north into the forward positions. When taken over, the road was mainly an impassable mud bog. The first job was getting water off the road, and the second was adding rock. A platoon of the 425th Engineer Dump Truck Company was attached, to aid in the hauling of river gravel and stone. Entrances to unit bivouac areas along the road were a constant source of trouble, especially as vehicles drove off and onto the road regardless of culverts. Each time mud was carried onto the road, gutters caved in a bit more. In November, a 220-foot Bailey bridge was built on Route #6528 at San Andrea, to replace the low level Bailey which had been washed out in the fall flood. Fourteen hundred foot approaches were constructed, and the bridge built with fifteen feet of clearance from the water level. 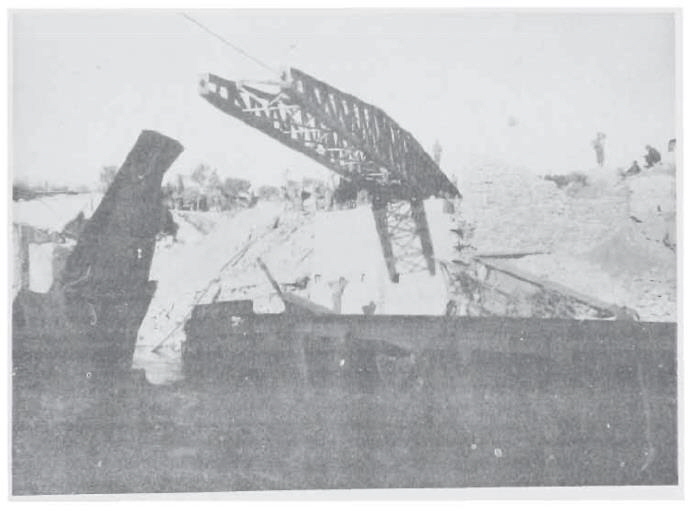 When the job was completed, the 182nd removed the destroyed bridge from the turbulent water. Throughout December, the 182nd Battalion rested at Castelfiorentino, after turning its road work over to the 169th Battalion on 29 November. While at this site, minor jobs were done: air strip at Siena, and prefabricated huts for 15th Army Group in Florence. Company “B” was placed on temporary duty with the 185th Engineer on 13 December to aid that unit in the maintenance of Highway #65. From 10 January to 22 January, a 180-foot, triple-single Bailey bridge was replaced at Contea on Route #67, east of Florence, with semi-permanent timber-steel structure. In January, five fixed bridges were constructed to replace Bailey in the vicinity of Barberino on Routes #6621 and #6625. Masonry work necessary was done by Italian civilians. Heating and repair work was done in January and February on the enlisted men’s rest center in the central railway depot in Florence, and on the enlisted men’s club in Montecatini. On 14 February, the battalion was placed on special duty with the Military Railway Service to help with the reconstruction of bridges and the railroad bed from Florence to Empoli. The tracks had to be patched all along the route, for every section had been destroyed. The largest jobs were the spanning of three breaks necessitating the erection of three 105-foot Unit Construction Railway Bridge spans. The spans were thrown across on 7, 9 and 13 March, respectively. While with Military Railway Service, the 182nd repaired twenty-seven kilometers of single line track, installed 18300 lineal feet of sidings, and rebuilt or repair sixty-three smaller breaks. The first train ran over the track on 20 March, approximately four week ahead of schedule. On 31 March, the battalion was relieved from duty with Military Railway Service and returned to full duty status with the 1338th Engineer Combat Group. The next day, the battalion began to move north. Road work was taken over from the 169th Engineer Battalion on Routes #6531, #6529 and #6530 in addition to the smaller connecting trails. Battalion headquarters moved on 2 April to an area near San Benedetto on Route #6530. The 185th Engineer Combat Battalion, commanded by Lieutenant Colonel Chester S. Wagner, became the third battalion of the 1338th Engineer Combat Group on 25 September. On 4 October, Lieutenant Colonel Wagner returned to the United States and was replaced by Lieutenant Colonel Maurice P. Shaver. The next day, the battalion began the maintenance of Higway #65 from Montecarelli to Monghidoro. The work was mostly maintenance, drain ditches, filling pot holes, removing mud and water from the road, repairing culverts, and cribbing and revetting road shoulders, wherever necessary. Maintenance of Route #6528 to Firenzuola was taken over from the 182nd Engineers at the same time, as well as the lateral from just south of Loiano, north and east to Cassano. Bridge repair work was done, three Bailey bridges were removed, one box culvert was constructed as was one Bailey bridge, a 270-foot double-single over the site of a damaged steel and timber bridge on Route #65 near Covigliaio. The 185th also did odd jobs on hospital and dumps, as well as drainage work and mine clearance. From 18 October to 18 November, 8500 cubic yards of shovel run, quarry rock, and crushed rock was produced from two quarries. As November arrived, the 185th Command Post was at Pietramala, were it moved on 25 October from Route #6525. The rock quarry set up at Monte Beni became the main quarry for the II Corp area throughout the winter season. In November, a Bailey bridge was constructed on Highway #65 at Covigliaio over an existing bridge, where the rains had caused the bridge’s concrete to crumble. Civilian mason repaired the bridge while the Bailey carried the traffic. Work was done for the 15th and 94th Evacuation Hospitals, but the biggest job was done for the 8th Evacuation Hospital at Pietramala, work which took from the 15 December to 17 January. 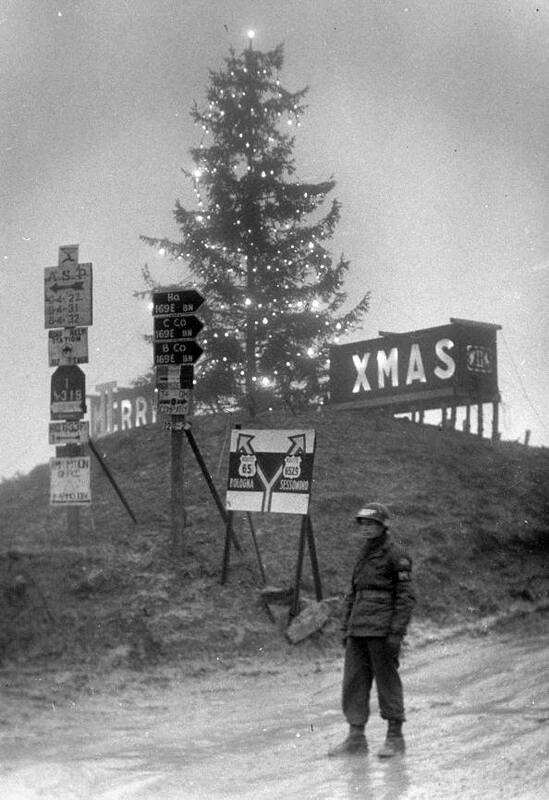 In December, snow-removal station were set up along Highway #65 and personnel of the battalion were given six-day rests at the center at Montecatini. In January, a semi-permanent bridge was built to replace a 90-foot Bailey bridge on Route #6528 near Firenzuola. The Bailey was first raised in place, then the fixed bridge constructed beneath the original. In January, snow removal was done on all the roads and the surfaces continually rocked. By the end of February, approximately 1000 civilians were employed by the battalion. In March, these laborers assumed greater duties such as the building of a permanent bridge near Filigare, a 30-footretaining wall at Monghidoro, and the operation of cut stone quarries at Monghidoro, Filigare and Route #6530. Two hundreds additional laborers were used during March. The road work in March changed to resurfacing Route #65 with asphalt mix, rolling and grading the highway, rather than filling pot hole with gravel. One of the incidental jobs done by the 185th Engineer Combat Battalion at this time was the construction of a cub landing strip at Fifth Army Headquarters. The airfield was unusual because of its sloping runway. The only place possible to build the strip near the headquarters was on a hill where the runway slopped from 9 degrees at the lower end to 15 degrees at the upper end. Pierced steel planking was used in the construction. Although it proved very successful, pilots soon dubbed the strip, “The sky Jump”. On 3 April, the 169th Engineer Combat Battalion of the 1338th Engineer Combat Group moved to Cascine Nuove, and began to train on the Arno for the construction of a floating Bailey bridge across the Po. The training lasted for two weeks. On 20 April, the entire battalion moved to Route #6531 and began patrolling the road. Four days later the battalion moved again, this time only a short dis¬tance out of Bologna. Company “B” erected a Bailey bridge on Highway #64 across the Reno River just southwest of Bologna, and Company “A” began another one across the Reno on Route #6620 just east of Praduro, But before the work could get any further than the clearing of piers and abutments, the battalion again moved. At 0630 hours on 25 April, the advance party reached the Po at Ostiglia. The infantry was still clearing German soldiers from ruined buildings across the river. The surveyors set up the center line of the bridge and the dozer operators began work at once, one of the dozers being ferried across to the far shore. The dozer operators worked until noon of the following day. At this time, materials had arrived in such quantities that actual construction of the bridge could get under way. From the time that actual construction started on the Class 40, 1000-foot floating Bailey until the bridge was finished, thirty-four hours elapsed. Before the bridge had been completed, the dozer operators were again at work in clearing another site at the Adige River near Legnago. The bridge, a 474-foot floating Bailey, was constructed in a period of ten hours. 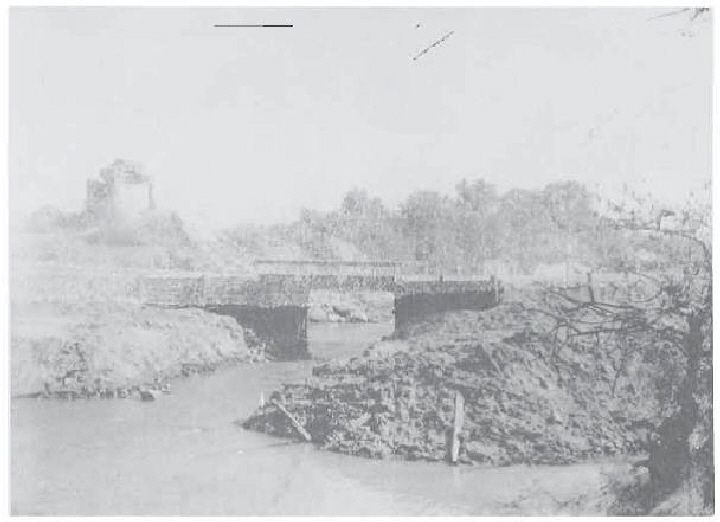 As the war came to an end, the 169th Engineer Combat Battalion, commanded by Lieutenant Colonel Roy A. Doman, began the construction of permanent bridges to replace the tactical bridging and worked on road and floating bridge maintenance. The 182nd Engineer Combat Battalion, under the command of Lieutenant Colonel M. P. Barschdorf, moved to San Benedetto on 2 April, and the companies assumed road duties on Routes #6529, #6530 and #6531. Approximately one thousand Italian civilians were hired to work on these routes. On 18 April, work was begun on a two-way Class 40 semi-permanent bridge at Vergato on Route #64. Timber trestle bents were built on four existing piers, and five pile bents were erected, one in the middle of each span. This ten span steel stringer bridge was completed in nine days and opened to traffic on 27 April. The Bailey bridge on the nearby by-pass was dismantled and hauled to the bridge dump. On 21 April, work was begun to replace a 110-foot Bailey bridge on Route #64, three miles north of Vergato. The bridge was completed on 30 April. 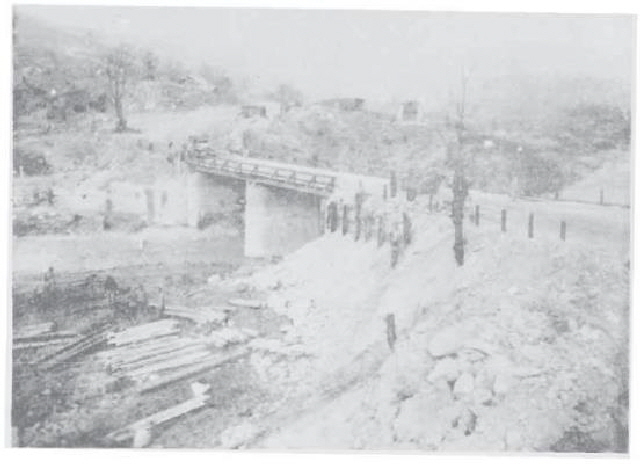 The battalion had five bridges under construction and approximately twenty-four miles of road to repair and maintain during this period, in addition to several minor jobs. Besides the two bridges mentioned above, the unit built an 83-foot timber trestle bridge at Spertica, seven miles north of Vergato, both on Highway #64, and a 540-foot double-single continuous Bailey bridge on Route #6620 at Praduro. The 169th had cleared the rubble from the six masonry piers of this latter bridge and had begun the erection of the Bailey panel piers on top of them when relieved by the 182nd on 25 April. The bridge was open for traffic the first part of May. On 1 May, a 600-foot treadway bridge was built across the Po River at Piacenza. The same day, work began to replace a 180-foot Bailey bridge on Route #9 between Castelfranco e Modena. The site was prepared, and then the 182nd was relieved of the job by the 185th Engineers. In addition to bridge work, there was, of course, road maintenance. On 19 April, the battalion had been assigned Route #64 from Vergato to Calvanzano. On 22 April, the assignment was extended to include Route #64 from Calvanzano to its junction with Route #6620. By 24 April, the battalion had Route #64 from Vergato to Route #9 and a portion of Route #9 from its junction with #64 to the Reno River. Several days of wet weather caused traffic to pile up in muddy bypasses and fills which had carried the heavy traffic adequately when dry. By the end of the month, however, these weak spots were repaired; all fills had been brought up to grade and rock-surfaced, and the bypasses were rocked and drained. On 28 April, the battalion was assigned the maintenance of Route #9 from Castelfranco to Modena. The push into northern Italy and the large number of prisoners taken made necessary to enlarge and build several prisoner enclosures. The 182nd cleared an area and building in Modena for the Fifth Army Rear Command Post, and laid matting for an air strip. On 5 May, the battalion was assigned the job of opening Route #12 from Modena to Rovereto. As the European War ended, the 182nd Engineer Combat Battalion was working on roads, on a prisoner of war enclosure at Modena, and on three semi-permanent bridges. In the first part of April, the 185th Engineer Combat Battalion, under the command of Lieutenat Colonel M. P. Shaver, was resurfacing Highway #65 with asphalt and stone for a stretch of eleven miles. Never had traffic been so heavy on the road; the average rate was one military vehicle every twelve seconds. Teams from the 185th worked in forward areas near Livergnano, locating and marking minefields On the day of Bologna’s capture, a 90-foot Bailey bridge was constructed on Route #65 on the city’s outskirts. Immediately, a semi-permanent bridge was started underneath the Bailey. Another urgent work order was building a bypass and clearing debris from Route #65 through the ruined and much booby-trapped town of Pianoro. At the end of April, all work on Route #65, including quarry and asphalt plant operations, was turned over to the 226th Engineer General Service Regiment. From 1 November 1944 to 1 May 1945, the 185th had employed 2500 civilian workers, the highest daily attendance being 1555. Many of these were skilled artisans, masons, stone cutters, blacksmiths and mechanics. The quarry at Mont Beni had produced a total of 105252 cubic yards of rock during the winter. This quantity was broken down into 40000 cubic yards of quarry run rock, 50100 yards of primary crushed rock and 15150 cubic yards of secondary crushed rock. Other quarries were located at Filigare, at Traversa and in the riverbed on Route #6530. The total production of these latter quarries was 7000 cubic yards. In May, the battalion moved up on Route #9, the companies being strung out between Boloogna and Modena. 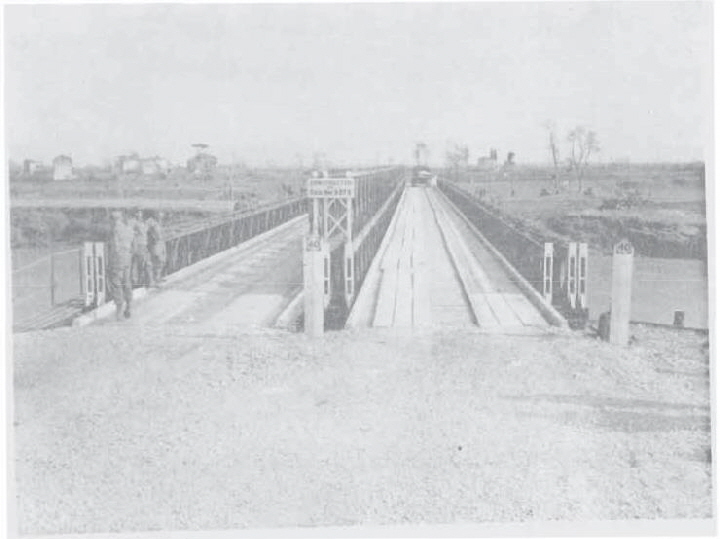 A second Bailey bridge was built beside the one-way bridge across the Reno River just northwest of Bologna. It was built on the partially blown masonry bridge. Special base plates were welded onto long triple steel girders to take care of the overhang. The bridge was completed on 6 May. 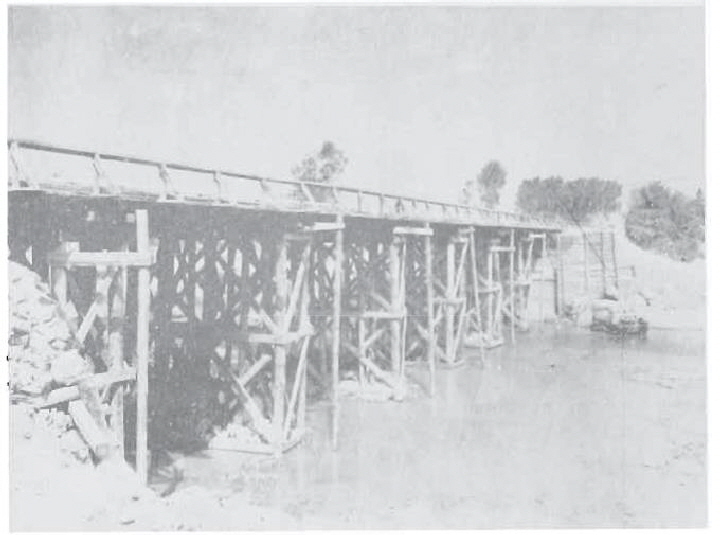 At the same time, a Class 40, two way fixed bridge was built on Highway #9. Between Castelfarnco e Modena, a 176-foot, four-span fixed bridge was constructed and was fifty per cent completed on 8 May. the third part is the voyage home from Verona (BN HQ 12) to Leghorn (BN HQ 15). 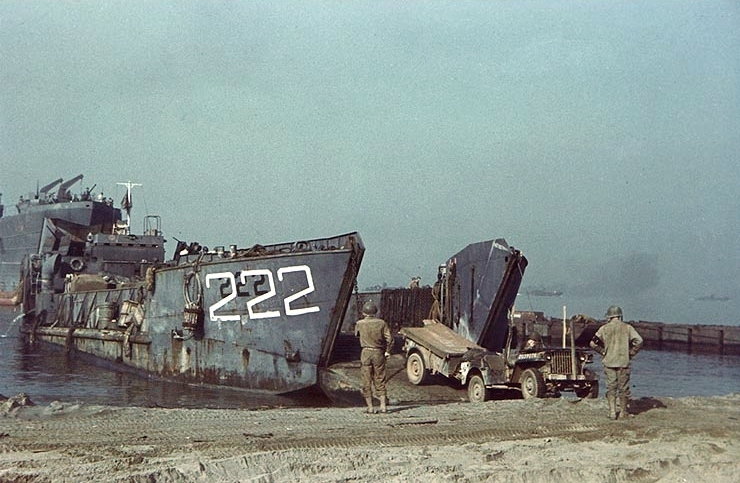 The two weeks spent at Cascine Nuove was used to train the Battalion in the Floating Bailey bridge in planning the operation in the Po river area. Red lines: the path followed by the BN HQ from Florence (BN HQ 01) to Piancaldoli (BN HQ 06). Green line: the path followed by the BN HQ from Cascine Nuove (BN HQ 07, training place for the floating bailey bridges) to Verona (BN HQ 12). The following is the link to a transcript of the final edition of the The Trooper, a newspaper that was printed on-board a ship that was taking soldiers from Italy, through the Panama Canal with a destination of Manilla in the Pacific Theater. The USS General M.B. Stewart (AP-140) departed from Leghorn, Italy on August 7, 1945, carrying 3000 US servicemen for the battle against Japan. The troops consisted of several engineering battalions of the 5th Army, medical battalions, and an air force squadron. The Troooper was printed to keep up the morale of the troops. These papers were simple memographed pages with sketches provided by the editorial staff. 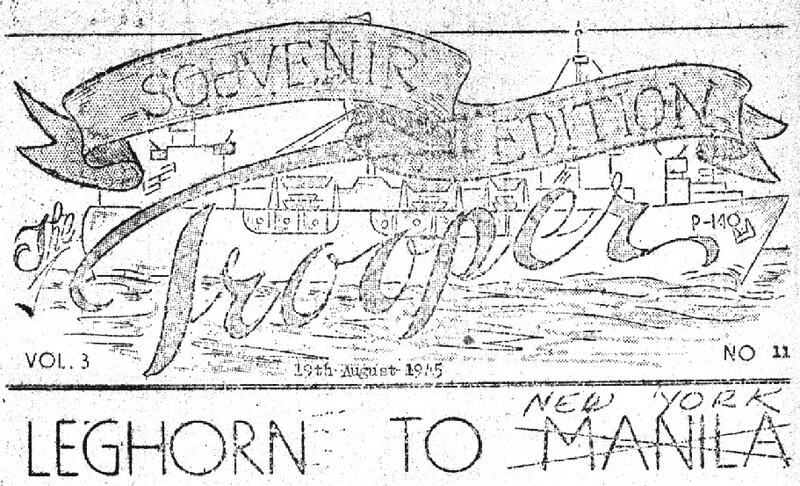 This edition of The Trooper was a souvenir issue distributed at the end of their voyage and included jokes, poems and stories about their last voyage. It shares their excitement when it is announced that Japan has surrendered and the ship would be headed for New York City. The 3000 men broke into celebration, tears and pure joy of freedom—freedom from war. The USS General M. B. Stewart, full of happy servicemen, arrived in New York harbor on August 19, 1945–the first troop ship to arrive in New York after the war ended. Most of these units were in Italy under the command of the 5th Army.